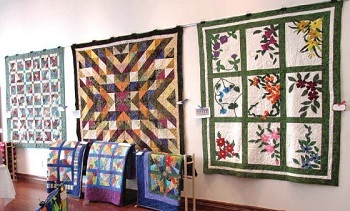 The 16th Annual Artesia Quilters Guild exhibit is currently on display at the Artesia Historical Museum and Art Center now through Sept. 30 during regular Museum hours: 9 a.m. – noon and 1-5 p.m. Tuesdays-Fridays and 1-5 p.m. Saturdays. Large groups are encouraged to call ahead, and we can accommodate after-hours tours by appointment as well. As always, this year’s show features all-new, never-before-exhibited works created by Guild members. Artesia Quilters Guild members have a reputation for creating unusual works — even traditional patterns and designs are given a fresh twist through non-traditional fabrics and techniques. Guild members created crazy quilts as a Guild project this year — a great way to use up scraps and experiment with color. For comparison, there’s also a traditional vintage crazy quilt in this year’s show, done in rich velvets. We’ve also got a Christmas-In-September corner, with holiday quilts. Besides the usual fabulous quilts and wall hangings, there are lots of nifty small projects: pillows, table runners, mouse and frog pincushions, purses, duff el bags, bowls, casserole carriers, a cosmetics organizer, pen and pencil organizer mugs, and retro aprons — which just go to show that just about anything can be quilted!